For sale is my 1982 suzuki RM-125, I always wanted one of these, i had a chance to buy this one 4 years ago, so i did, it was in very rough shape but it ran (badly). i stripped it down to nothing, re did everthing. and here we go. Blasted, powder coated frame, powder coated rims, replaced all plastics (reused old tank because it looks really nice (just cleaned and polished it), installed new tires and tubes, all new spokes, rebuilt forks, chromed lower legs, cleaned and polished all aluminum, all new seals and dust boots, power coated original handle bars, new grips, new pads, new seat( customized with 2000 effex cover), new decals, tore motor down installed new gaskets, newer yoshimira muffler, i have done a lot of work. ok so you get the picture, there is more is more ubt i hate to type. ok the bad, i cannot get it to run, could be coil or rings, compression is like 105psi, could be ????? ?, all i know is i am moving and out of money, i just put money in my four wheeler and am needing a new truck. 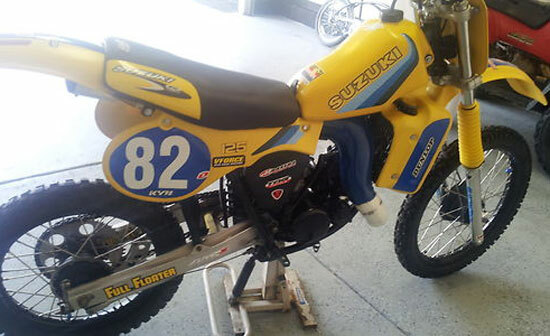 so i have decided to see if my bike will sell, i know it is not running but look at pictures, do a little work and you got a vintage race ready bike. i will not give it away but am open to offers, send me any emails with questions or if you are local stop by and see it. i am in columbus ohio 43119.